A couple days ago I was craving some comfort food. Seeing the box of Fettuccine in my cupboard, all I was thinking of was a gigantic bowl of Fettuccine Alfredo. 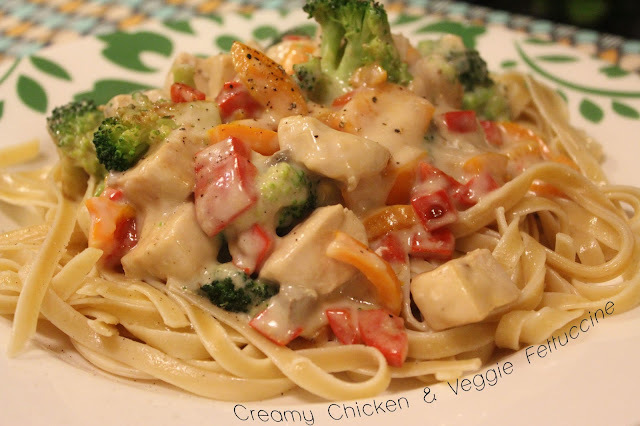 However, I was not in the mood to make my own creamy sauce, so I improved a little on this one. It turned out really great, too! This recipe is pretty simple in terms of ingredients. However, it gets a little difficult with timing the separate ingredients to come together at the end. It's worth a try though, because it was so tasty. Drizzle some olive oil in a pan and cook the chicken on medium heat until cooked through. In the meantime, get your noodles cooking, taking care to stir frequently so the noodles don't stick together. When the noodles are cooked, strain and set aside. Drizzle and mix with olive oil. The olive oil will make sure the noodles do not stick together until the other ingredients are finished cooking. In another pan, heat some olive oil and add the peppers. Cook over medium/high heat for about 5-7 minutes or until cooked. Combine cream of mushroom soup, milk, and garlic powder to the pan with the chicken. Heat over low and stir until combined. Add the cooked peppers to the chicken/sauce mixture. In the same pan that the peppers cooked in, add the broccoli and water. Cover and cook/steam on high for about 3-4 minutes, or until broccoli is cooked, but still crispy. Take care not to overcook the broccoli. Top this mixture over the Fettuccine on separate plates. Season with pepper to taste, and enjoy!